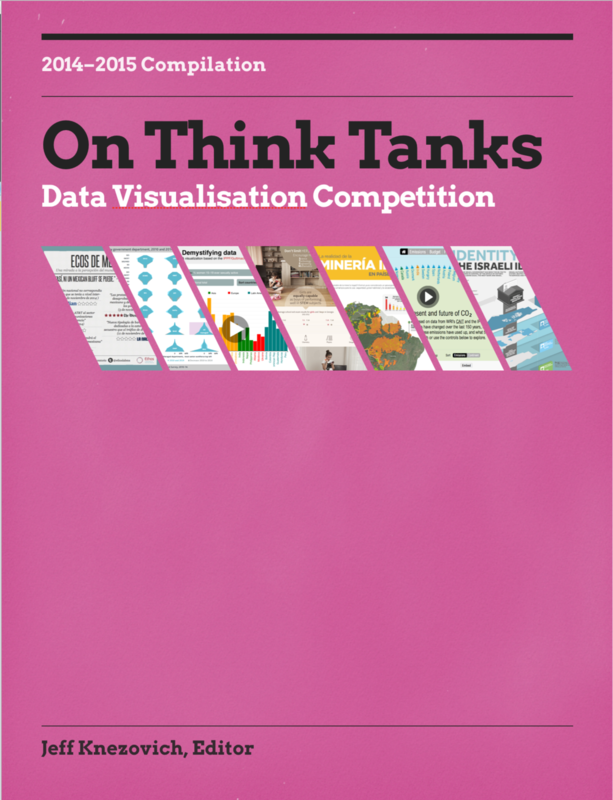 The On Think Tanks Data Visualisation Competition was back for the 2014–15 season. Building on the success of our first competition in 2013-14, we made several changes to the competition, how it is run and some of the additional resources we added on to the competition. Most importantly, we divided the rounds based on the type of entry. The first round was open to static visualisations. The second round was for interactive visualisations. And the third and final round was for the best example of a data visualisation as part of a communication strategy. We also opened up the competition to any think tank around the globe. Despite these changes, the overall objectives for the competition remained the same: to inspire think tanks and similar organisations with successful examples of impactful data visualisation; to strengthen capacity for these organisations to produce high quality visualisations through a number of complementary resources and ‘how to’ guides; and to encourage think tanks to produce visuals by way of cash prize. This is now the second year of the competition, and it ran between September 2014 and February 2015 at http://ttdatavis.onthinktanks.org. The competition saw significnat support from the Open Society Foundations’ Think Tank Fund. We also brought on Infogr.am, an online data visualisation platform, as project supporter, providing prizes and a judge. Altogether, we had 32 unique submissions across the three rounds. But Round 3 was open to entries from the previous rounds and were judged on their communication strategy rather than just the visualisation itself. Submissions spanned 19 countries and 31 think tanks. The topics of the visualisations covered a lot of ground. The second round of our competition coincided with the COP20 climate negotiations, which meant we had quite a few focused on climate change and the environment. This book is a compilation of all of the visualisations that competed, in addition to interviews with the producers of the winning visulisations and relevant resources and ‘how to’ guides for making data visualisations. This is now the second year of the competition, and it ran between September 2014 and February 2015 here at http://ttdatavis.onthinktanks.org. The competition saw significnat support from the Open Society Foundations’ Think Tank Fund. We also brought on Infogr.am, an online data visualisation platform, as project supporter, providing prizes and a judge. Or download from the iTunes store.